As pastor of a parish, I find that it is my honor to be the celebrant of the Holy Thursday Mass in our parish. This feast is so very rich in meaning: the Eucharistic celebration invites us into the wonder and mystery of the Last Supper as Jesus gives us the most precious gift of His Body and Blood. Flowing from the institution of the Eucharist is the establishment of the priesthood for the Church. At the end of the Mass, a procession of the Eucharist moves around the church, and there is a solemn period of adoration of the Blessed Sacrament. This recalls the desire of Jesus to have His apostles “watch one hour with Me” as He prayed to His Father in the Garden of Gethsemane. 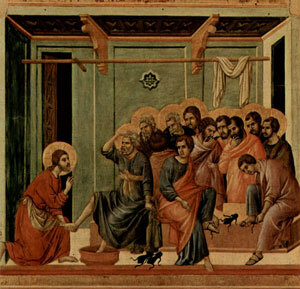 All of these wonders move the heart to prayer, but I find the act of Jesus’ washing the feet of His disciples—the first sermon given at a Mass, and one without words—to be the most moving moment of a night filled with grace. Holy Thursday is a night to adore God and to see Him in our brothers and sisters.